I have a long professional and personal history working with people living with dementia. My mother was a gerontological social worker who used to share some of the struggles people with dementia faced including feeling isolated, alone and misunderstood. Following in her footsteps, I too became a social worker for older adults and began to hear those stories firsthand. As I listened, it occurred to me that many of the challenges that persons with dementia faced were created by us as a society. Their isolation, for example, seemed directly related to our tendencies to talk about them instead of to and with them. I have a long professional and personal history working with people living with dementia. My mother was a gerontological social worker who used to share some of the struggles people with dementia faced including feeling isolated, alone and misunderstood. Following in her footsteps, I too became a social worker for older adults and began to hear those stories firsthand. As I listened, it occurred to me that many of the challenges that people with dementia faced were created by us as a society. Their isolation, for example, seemed directly related to our tendencies to talk about them instead of to and with them. I knew that if the lives of those with dementia were to improve, we had to start asking what we as professionals, researchers, family members and citizens were doing to include them from the decisions that directly affected their lives. One area that needs a lot of improvement is end-of-life care. Because we find death a taboo subject, end-of-life care is not a topic people like to discuss. As a consequence, we only start talking to people about their preferences for end-of-life care at the very end, when many people, especially those with dementia, are not in a position to speak for themselves anymore. This excludes people with dementia from being the centre of their own end-of-life planning. Encouraging earlier advance care planning, the topic of my project funded by the Alzheimer Society Research Program, is one possible solution to this dilemma. Because advance care planning encourages open communication about future care well ahead of need, it offers people with dementia a chance to speak to family and health providers about their preferences for end-of-life care while they’re still able to do so. 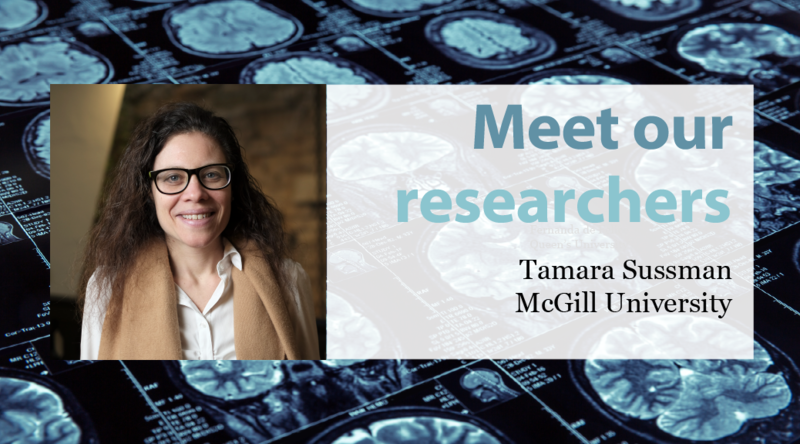 Video: Tamara Sussman, Associate Professor in the School of Social Work at McGill University, talks about her research on advance care planning for persons with dementia. Dr. Sussman received a Quality of Life Grant from the Alzheimer Society Research Program (ASRP) 2017 competition. Most recently, Dr. Sussman participated as a peer reviewer in the 2018 ASRP Quality of Life Panel. Why is advance care planning important? We know that people with dementia receive poor end-of-life care, and a lot of people are guessing what they might need and want. If they are living with dementia for many, many years, and end up dying with an advanced dementia, it’s likely they’re not going to be able to articulate what they want for themselves at that time. The conversation about advance care planning doesn’t have to be discussed right on the date of diagnosis, but perhaps it should happen within the year. By thinking ahead, a person who has been diagnosed with dementia can communicate what they’re worried about and what they would like to see happen while they’re in a position to be able to articulate their thoughts and concerns well. They may bring up something that people responsible for their care otherwise wouldn’t think about! When we encourage these conversations much earlier on, we can remove some of the barriers placed on people with dementia. By giving them the opportunity to talk, they can place themselves in the centre of their end-of-life care, where they should be.